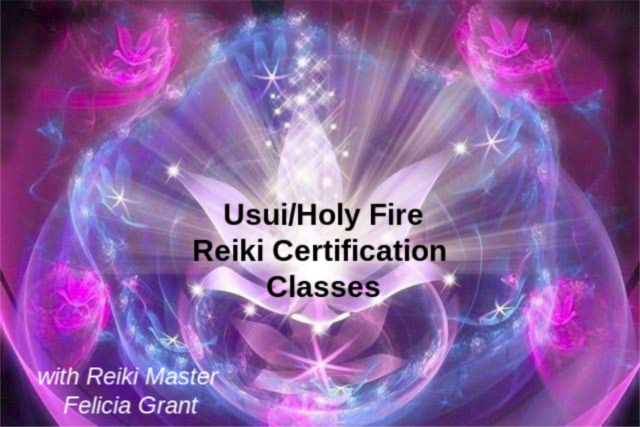 In a Reiki Workshop, you will experience through Meditation a direct connection to the Holy Fire Reiki. This allows you to tap into an unlimited supply of “life force energy” to improve one’s health and enhance the quality of life. Do you want to raise your emotional and physical vibration? Feel more energetic and balanced, free of pain and full of possibilities? If you are interested in learning an effective method for relieving stress and anxiety, reducing pain, and promote healing. If you are looking for something to help you with spiritual growth, this class can help you. Reiki is an art of healing that cascades universal life force energy. This universal life force energy assists the body, mind and spirit to enhance your natural ability to heal. In this One-day class, you will be attuned to Reiki energy, connecting you to this incredible source of powerful energy. You will be opened to the flow of Reiki enabling you to channel its energy to yourself, your pets and family. You will be taught how to allow this focused life force energy to come from the source and to flow through you. Reiki itself is a powerful teacher. It is important to allow Reiki to instruct you, to trust your intuition and use Reiki to create your own relationship with the energy. In this class you will learn the history of Reiki, the original Reiki principles and techniques as taught by Usui Sensei, who brought forth Reiki. You will also learn the hand positions for self-healing and the healing of others. Scanning, stabilizing and grounding your energy and your clients will be taught. There will be hands on practice and discussions throughout the class. Students will have the opportunity to review what they have learned and practice feeling energy through their hands. Each student will receive a certificate of the completion of the class. Reiki is for everyone!! Anybody can learn. Reiki is not learned with the conscious mind. The ability to flow Reiki energy is acquired through a attunement process done by a Reiki Master. Is important to understand that Reiki cannot be “learned” or “received” in any other fashion. Receiving an attunement via a Reiki Master in person is the ONLY way. This course will certify you according to the guidelines of the International Center for Reiki Training, to practice Reiki upon completion of this workshop. Do you want to start a Reiki Practice? Once attuned you will have Reiki for life; but it’s important to receive Reiki attunements in person from a Reiki Master. This course will certify you according to the guidelines of the International Center for Reiki Training, to practice Reiki upon completion of this workshop. Reiki is an art of healing that cascades universal life force energy. This universal life force energy assists the body, mind and spirit to enhance your natural ability to heal. In this One-day class, you will be attuned to Reiki energy, connecting you to this incredible source of powerful energy. You will be opened to the flow of Reiki enabling you to channel its energy to others and yourself. You will be taught how to allow this focused life force energy to come from the source and to flow through you. Reiki itself is a powerful teacher. It is important to allow Reiki to instruct you, to trust your intuition and use Reiki to create your own relationship with the energy. REIKI SHARE ♥ RELAX, REJUVENATE, RECONNECT Reiki healers at all levels, feel welcomed by a group of like-minded friends. Develop your Reiki practice and gain needed experience. Non-healers come to receive the healing effects of Reiki. First come, first serve. Felicia Grant, Reiki Master. 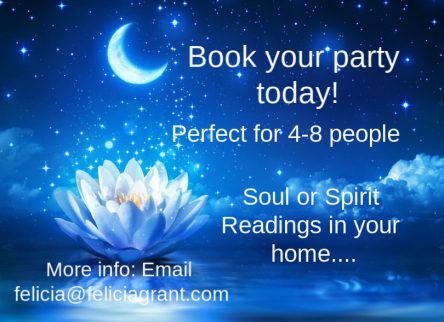 Join Certified Psychic Medium Felicia Grant in this once a month support group for parents and siblings that have lost children. We will encourage and support the an open discussion of spiritual experiences and evidence for the afterlife, in a non-dogmatic way. Bring the Medium to YOU….. Cost: $44.00 per person (Minimum 4 people please). If there will be 10 or more guests, a discount will be applied and it will be $40 per person.